Discussion in 'USA Made Blade' started by Whitty, Oct 18, 2018. We have had another fun week doing some more anodizing and customizing. This week we have 5 new knives to offer. 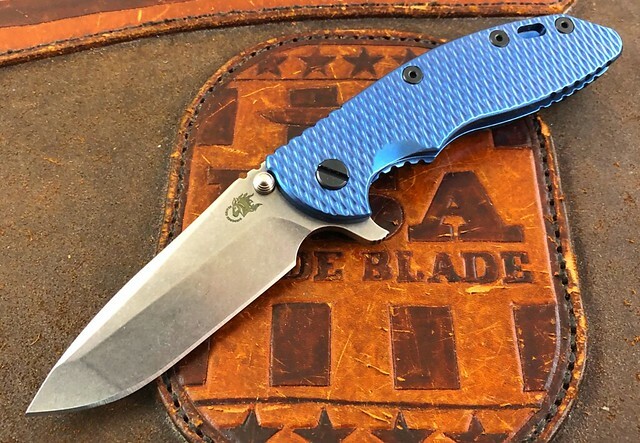 Work done does not affect the Hinderer warranty as we are an authorized anodizing dealer for Hinderer. First up is a Full Ti (Gen 5) 30 year edition that is blue anodized and decked out with black hardware. 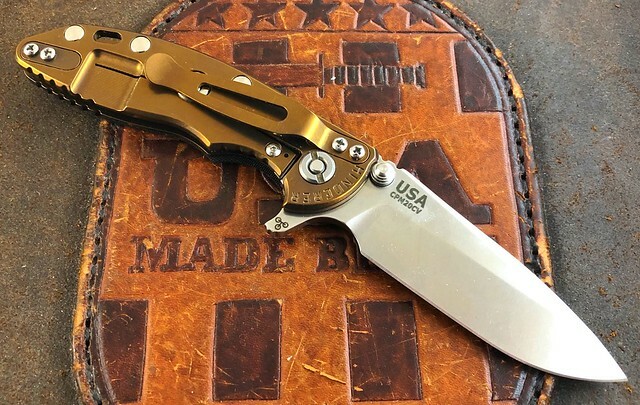 Gen 5s were only out for a short time and are very rare in the Hinderer world. 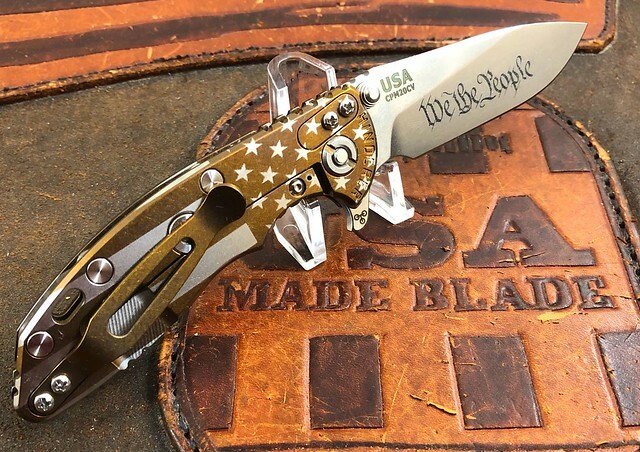 Next up is a War Bronze Anodized Stars and Stripes Half Track with "We The People" engraved on the blade and decked out with full copper hardware. This will really look badass when the copper hardware forms a nice patina! 3rd on this weeks line up is a dark bronze anodized XM-18 3" Spearpoint with Tri Way Pivot System. A lot of folks have mistakenly called the 3" a Gen 6 but in the 3" size it is a Gen 4 with the tri way pivot and steel lock insert. The dark bronze on this one is very rich in color and really pops on the knife with the black G10. 4th this week is a new War Bronze XM-18 3" Spanto with Tri Way Pivot System. We introduced our new War Bronze color last week and have had a ton of request for more of them. This color is only able to happen on Working Finish Hinderers, which we have limited numbers of. 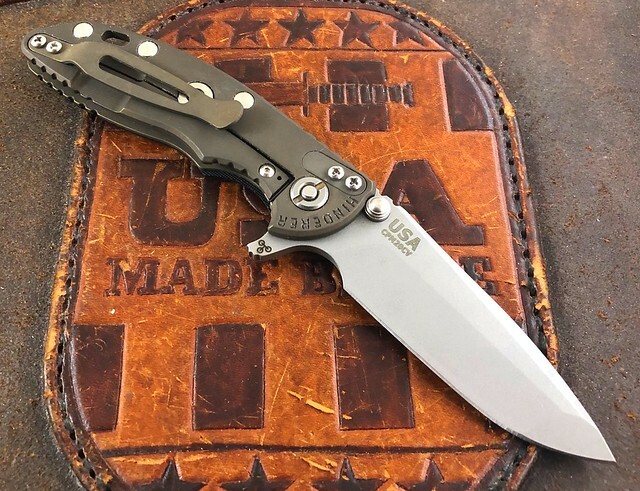 Last for this week is one of our personal favorites at USA Made Blade. 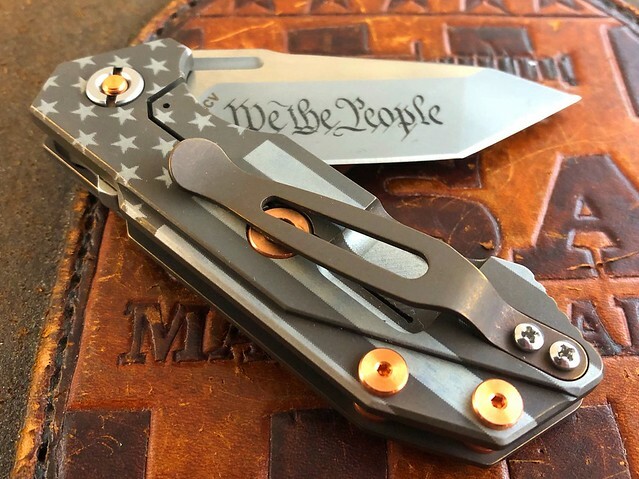 Bronze Stars and Stripes "We The People" XM-18 3" Slicer with Tri Way Pivot. This knife is just stunning in person and something anyone would be proud to have in their collection.